PPKP Tip #1: Health Points. The combined HP (short for hit points) values of the stat you are using determines how much damage you can take from enemies before you die and lose the level you are playing. Enemies get tougher in later cities, so keep leveling up! You can level up by buying foods, beverages or snacks. Higher costs means more stars to level up. However you can't eat any kind of a food if you have a full health points, thus you should participate in battles to earn coins and get beat up by the enemies to be able to consume any kind of food. PPKP Tip #2: Fuel Management. You can earn coins by defeating enemies. Defeating tougher enemies will give you more coins. Tougher enemies can be found at other cities. 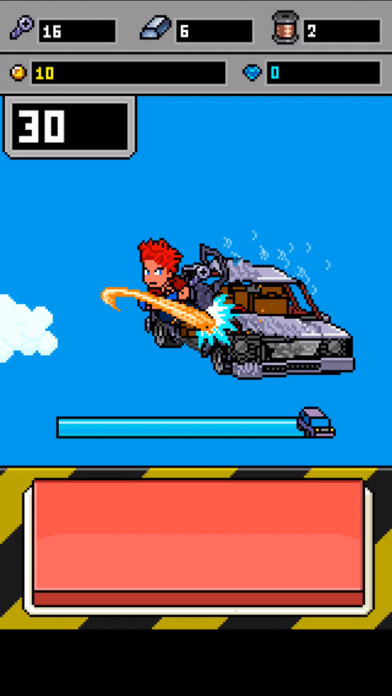 You can use taxi to beat enemies in your own city or you can use helicopter to travel to other cities. Traveling using taxi or helicopter requires 1 fuel. You can only have a maximum fuel capacity of 5. Fighting is very important to earn coins which will give you an opportunity to progress in the game by upgrading your character, unlocking skills and etc. But you can't fight if you don't have enough fuel. The game doesn't have a settings or feature to notifies you when you already have a max fuel capacity, so using any third party reminder apps or your alarm app can help you manage your fuel efficiently. PPKP Tip #3: Using Scouter. Scouter helps you identify the status attributes of your enemy such as the attack and defense attributes. However the most important attribute of the enemy you should know is what kind of attack is his weakness. Executing the right kind of attack is crucial to quickly eliminate enemies as soon as possible. Reducing their attack turns is important if you want to survive more longer. You can reduce their attack turns if you can knock them out through efficient and high output damage from your character. Higher level scouter will give you clue if you can stun or applying other negative buffs to the enemies. Every attack turn requires an energy slot to execute punch, kicks, combos and etc. More energy slots means more attacking actions you can execute to the enemy. It is more beneficial if you can kill enemy in 1 attack turn to avoid receiving damage from your enemy's attack turn. Upgrading you're energy slot will make your battles more easier, thus you can proceed to other cities for more bonus coins. PPKP Tip #5: Counter Attack. To be able to execute a counter attack, you just need to wait for the enemy when he it is at close distance while he is attacking you. If you can press any kind of attack while he is at close distance, you will do counter attack without receiving any kind of damage form the enemy. This is an important skill when enemies that has high damage output. Those enemies can still greatly hurt you even if you successfully use your shield to block their attack, so doing counter attacks will negate or dodge the enemy's attack.